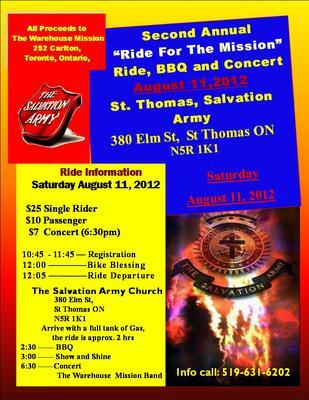 On August 11th we are riding in support of the Salvation Army Warehouse Mission in Toronto. I have included a poster but registration begins at 11:00am at the Salvation Army Church in St. Thomas ON. The ride will take about 2 hours and roll through three ports on Lake Erie; Port Stanley, Port Bruce and Port Burwell. The ride will end back where it started with a barbeque.